The first airplane landing in Kailua-Kona was on August 21, 1935 by Hilo aviator Alfred W. Smith. Smith landed his Aeronca single-seated monoplane on a cleared area about a mile north of Kailua, the first airplane ground landing ever made in Kona. Previous flights to the Kona district of the Big Island were made by seaplanes. Smith landed and let off his passenger Charles A. Okuna of Hilo, one of his flying students, then took off and landed again. He landed at a site he had cleared of rocks the previous week. Smith, a 1931 graduate of Punahou School, received his license as a glider pilot first class in 1931, becoming the 44th person in the United States to win this recognition. He worked at the Boeing Aircraft Corp. in Berkeley, CA, for two years before gaining his commercial pilot’s license and eventually returning to Hawaii. He purchased the Aeronca from Moreau Flying Service where he worked for a year as a pilot. In the late 1930s construction of an airport at Kailua, Kona suitable for transport operations had been advocated. An area parallel to the beach, previously used for small aircraft operations, and known as Kailua Airstrip, was determined to be the only suitable area in the vicinity. It was located about 1.5 miles northwest of the Kona Inn. Kailua was a small village and the heart of the Kona District of the Island of Hawaii. The Kona District had unique characteristics which set it aside as a distinct community offering local residents and tourists the greatest possible recreational change from the sugar and pineapple plantation background which characterized other areas in the Territory. “It is believed that the proposed airport would result in a great increase in tourist interest in the area and also in the development of vacation homes for residents of Honolulu,” stated a Department of Public Works report. “The general opening up of the area by providing means for quicker transportation to Honolulu would tend to interest young people of Oahu in the possibility of establishing themselves in the Kona area (where land is relatively available) and thus help solve the land scarcity problem which is critical on Oahu. 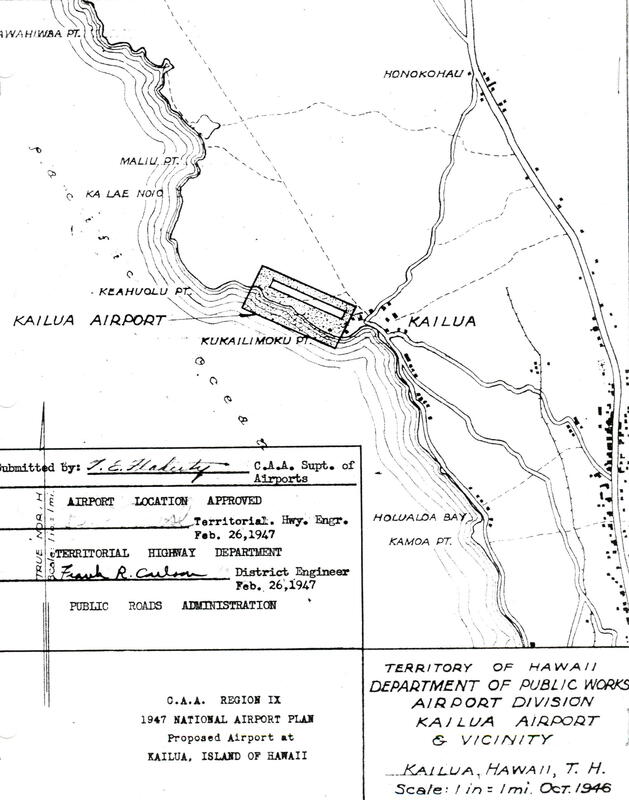 On November 29, 1940, the Department of Public Works of the Territory forwarded to the CAA an application for allocation of funds for Kailua Airport under the provisions of the 1940 National Airport Act. In July 1941, the CAA made a 100 percent allotment of $200,000 for the airport. It was understood that the said sum was to be jointly administered by the CAA and the Army. No work was ever started at the site but the original plans were approved by the Army, the Navy, CAA, Inter Island Airways Ltd. (now Hawaiian Airlines Ltd.) and by the Territory. When the original application was filed the territorial funds were available for the purchase of the site for the then appraised valuation. The allocation of funds ($8,500) for the land acquisition was subsequently confirmed by the Legislature by Act 35, Session Laws of the 1941 Special Session. The funds were available but no acquisition proceedings were started. Territorial funds in the amount of $140,000 were provided by legislative acts for construction and matched by the Civil Aeronautics Administration. Funds for the acquisition of lands in the amount of $47,500 were provided by Act 35, Session Laws of Hawaii 1941, and to this amount CAB provided $2,500 on a 75/25 basis. In October 1941, the Governor and the Superintendent of Public Works signed a contract for the Federal government to maintain and operate the airport when completed. On December 7, 1941 when the Japanese bombed Hawaii, the contract had been let and work was ready to start. No work actually started and none of the funds were expended. In 1944, the Post War Planning Division of the Territorial Public Works Department proposed proceeding with the airport when the war was over. The CAA agreed to honor the contract and advance funds to complete a 5,200 foot by 500 foot flight strip and a paved runway 5,000 feet by 200 feet. The proposed work consisted of one runway 5,200-feet long and 500 feet wide, with a plant mix asphaltic concrete pavement 5,000-feet long and 200-feet wide, 3,000-feet to be three inches thick and 2,000-feet to be two inches thick; boundary lights, range lights, contact light, rotating and code beacon, control panel and station to plane radio equipment; fencing of the entire field, and construction of an access road. The original plans were completed and ready to go when the allotment was received. The land had not been acquired; however, an agreement had been reached with the owner, based on an appraisal made in November 1941. When the allotment was made, the land was expected to be paid for as condemned. In April 1944, the DPW developed a master Plan for Kailua Airport with a runway of 200-feet wide by 5,000 feet long. The proposed cost of the airport was $7,500 for land; and $450,000 for construction of ground facilities. The CAA provided $450,000 for the construction. The funds for the land acquisition were still available. By Act 153, Session Laws of Hawaii 1945, the Legislature appropriated an additional $100,000 for location and aerological studies for the new Kailua Airport, and acquisition of land. The Superintendent of Public Works proposed to recommend that the 1947 Legislature appropriate any additional sum that would be acquired to assure the undertaking and completion of the project with CAA assistance. 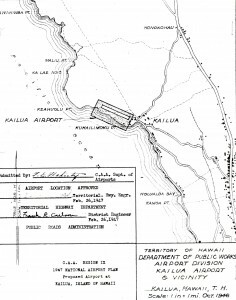 CAA Region IX approved the proposed airport at Kailua as part of the 1947 National Airport Plan as submitted on February 26, 1947. The 1947 Territorial Legislature, which created the Hawaiian Aeronautics Commission, took cognizance of the need for an airport in this area by officially designating the proposed location as Kona Airport and by Act 23, SLH 1947, appropriated $40,000 for improvements. The Kona project received high priority with the Hawaiian Aeronautics Commission which held two hearings at Kona during its first biennium. Surveys were made and plans prepared by the Department of Public Works, and in May 1948 bids were opened for construction of a runway 100-feet wide by 3,500-feet long, an aircraft parking mat and an access road connecting the main road through the village of Kailua. The low bid was $255,865 for this phase of the project. Work was started June 10, 1948 with a completion date of January 3, 1949. From the beginning, the project was plagued with delays due to many factors, some of which were no fault of the contractor. On May 3, 1948 the HAC passed a resolution adopting and approving the execution of a grant agreement between the Territory of Hawaii acting by and through the HAC, and the United States of American, CAA providing for Federal aid in the development of and the operation and maintenance of, Kailua Airport. Governor’s Executive Order No. 1310 dated February 16, 1949 set aside 3.843 acres of land for Kailua Airport and Access Road to be under the control and management of the Hawaii Aeronautics Commission. Bids were first opened for terminal building construction on January 7, 1949. The low bid of $49,000 was considered too high and was rejected. On March 12, 1949, a bid of $27,234 was accepted for this project and construction started April 1, 1949. Act 103, SLH 1949, appropriated $74,140 for the construction and completion of Kailua Airport. All scheduled and non-scheduled airlines within the Territory participated in the ceremony along with the Air Force, Navy, Civil Air Patrol, and many private plane owners. The entire Kona community, civil and service clubs and staff members of the HAC combined efforts to make the occasion a pronounced success. Others represented were the Civil Aeronautics Administration, Territorial Department of Public Works, several of the overseas airlines and many of the Territorial Legislators who were responsible for the appropriation of funds with which the airport was constructed. Hawaiian Airlines President Stanley C. Kennedy announced that additional weekend flights would be made by his airline on the Kona Coaster every Friday afternoon from Honolulu and returning every Sunday afternoon. “Kona will become, now more than ever, a must for the tourist as well as for local travel,” Kennedy said. Inter-Island Airways announced it would be making four trips a week into and out of Kona. 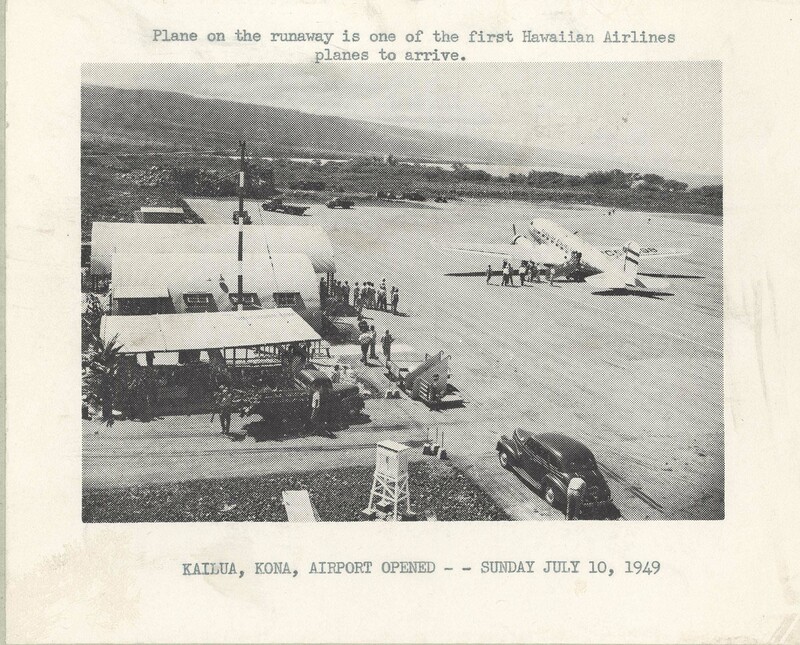 Hawaiian Airlines was the first commercial plane to arrive at the airport from Honolulu via Molokai at 11:30 a.m. bringing a full load of passengers and the first direct air mail from Oahu. It took off at noon bound for Honolulu with passengers and air mail. On August 1, 1949 the HAC set a rental rate of $2 per square foot per annum for lease space in the Kona Airport terminal. The Commission adopted a resolution on November 21, 1949 adopting and approving the execution of the Sponsor’s Assurance Agreement to the U.S. Department of Commerce Civil Aeronautics Office, to obtain Federal Aid in the development of Kona Airport. By June 30, 1950 Kona Airport was more than justifying its existence. It had natural advantages from the standpoint of air passenger business because of the many tourist attractions in the Kona district. Also, it had generated an impressive amount of air freight business. The airport was served regularly by all of the scheduled airlines in the Territory. The routine maintenance and custodial duties were performed by a full time Hawaii Aeronautics Commission employee. Some larger tasks required assistance from the Hilo staff and others were accomplished by private contract. A new improvement project was beginning at Kona Airport to lengthen the runway to 3,800 feet, shoulders would be paved for a width of 50 feet on each side of the runway, a freight handling area would be graded and paved, and the auto parking lot enlarged. The project was scheduled for completion in January of 1951 at a cost of $166,411. Also, plans were being prepared for a freight terminal building and for additional fencing in the terminal area. The Kona Outdoor Circle and the HAC employees worked together on a beautification program for the airport. Attractive concrete curbing was constructed around the planting areas adjacent to the terminal building. The project was completed in November 1949. Standard runway center-lane markings were painted and marker blocks along the edges of runway were painted. The property line of the airport was fenced to keep cattle off the operating areas. Approximately 5,000 linear feet of fencing was involved. The project was accomplished by contract through the Territorial Public Works Department and was completed in May 1950. Cost: $9,970. Air traffic increased sharply in June 1950 because of sight-seeing flights over the June 2 eruption of Mauna Loa. During this peak period the Kona runway was lighted all night for several nights with emergency flares to make it safe for possible emergency landings. Bids were opened on May 11, 1950 by the Superintendent of Public Works for the new grading and paving project at Kona Airport. Cost: $137,170. Actual work started on June 21, 1950. On October 23, 1950 the Director of Aeronautics was asked by the HAC to study extending the runway to a length of 4,250 feet. In February 1951, temporary runway lights and a rotating beacon were installed and the runway extension completed. In January 1951 Jeep crash fire trucks were put into operation at Kona airport. The second phase construction of Kona Airport consisting of 300 feet additional runway, grading, additional 400 feet, 100-foot shoulders graded both sides of runway, grading and paving an auto parking lot, air freight terminal area and access road was completed on January 25, 1951 at a cost of $152,402. Complete night lighting facilities consisting of rating beacon, runway marker lights and lighted wind tee were commissioned at Kona in March 1951. A new joint air freight terminal building was completed at Kona by HAC Maui personnel in April 1951, $20,137. Terminal area fencing was installed at Kona Airport in June 1951. Furnishing of the terminal was approved in June 1951 not to exceed $1,200. On July 23, 1951 the HAC recommended that plans proceed for the extension of Kona Airport to meet future requirements of Convair planes. 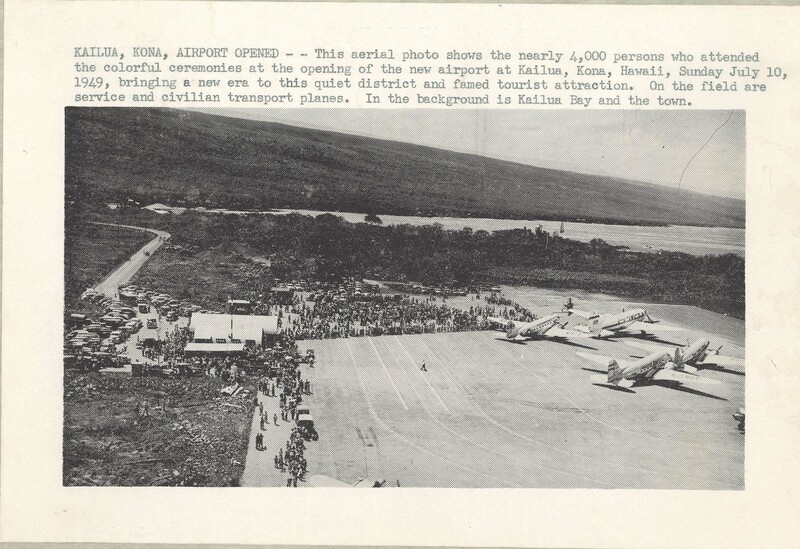 By the end of June 1951, Kona Airport has continued to grow in importance and activity. It was served by 25 passenger schedules per week and three freight plane schedules per week. There were two privately owned aircraft based at the airport. Also, there were a number of extra section and special flights. Routine maintenance and custodial duties were preformed by one full time HAC employee and one part time contract laborer. The HAC appropriated $20,000 in December 1951 to build four hangars for private owners at Kona Airport. The accessibility to Kona provided by air service through the airport stimulated tourist travel there, with attendant development of hotels. Air freight service provided a market in Honolulu for Kona produce. The unprecedented development of the area created a demand for a longer runway to accommodate larger aircraft. The project application for the Kona Airport runway extension was approved in September 1952 and a sum of $130,000 was authorized for the runway extension in December 1952. Extension possibilities of the runway dictated an extension of 500-feet toward Kailua and 600-feet toward the southeast. Bids were opened in September 1953 and the HAC awarded a contract for $163,247 to J. M. Tanaka for this project, but extension toward Kailua met with strenuous opposition due to the alleged encroachment on hotel planning. The contract was held up and the project restudied. A public hearing was held at Kona on October 17, 1953. Local opinion was divided and the Hawaii County Board of Supervisors presented a resolution opposing a delay in constructing the extension. On January 4, 1954 the Civil Aeronautics Board in Washington announced approval of the Kona Airport runway two-way extension project. A tax payer’s suit was filed a week later to restrain the contractor from proceeding with the work. Circuit Court Judge Calvin C. McGregor issued a temporary order restraining the HAC from proceeding with construction of the runway extension. The restraining order was issued following injunction suits filed by Lorrin P. Thurston and David Twigg-Smith, Kona property owners. Both owners contended property damages would result should the HAC proceed with its runway extension project of full use of their properties by limiting the heights of buildings to be constructed in the area. Further studies were undertaken to determine the feasibility of undertaking the necessary extension to the southeast end of the runway. Various delays were incurred in engineering work as well as in obtaining CAA approval and participation. The issue had not been settled by November 1954 when a mainland industrialist became interested in the development of the Kona area as a tourist Mecca. His plans would entail the complete relocation of the Kona Airport. Investigations both as to physical and legal aspects of such a project were underway in 1955. On May 17, 1955 Governor’s Executive Order No. 1684 set aside 131.83 acres of land for an addition to Kona Airport and Avigation Easement A. The HAC dedicated water lines at the Kona Airport to the County of Hawaii Board of Water Supply on September 24, 1955. Pavement rehabilitation was completed on January 18, 1956. Cost: $6,116. A project to relocate the Baggage Claim Counter was completed in 1956 as the cost of $1,000. On January 31, 1957 the HAC asked the Department of Public Works to proceed with the Master Plan of Kona Airport forthwith. Act 150, Session Laws of Hawaii 1957, known as the Hawaii Economic Development Act, appropriated $265,000 for the relocation of Kona Airport. Construction of a new airport to replace the present facilities was to be financed by the sale of the present airport site. The purpose of relocating the airport was to make this site available for the development of a tourist resort on the Island of Hawaii. In accordance with the provisions of this Act, the HAC used a portion of this appropriation for a study to select a new site and to determine the cost of construction a new airport. The HAC held a meeting in Kailua-Kona to give residents and other interested parties an opportunity to express their views regarding the future status of Kona Airport—whether the runway should be lengthened to accommodate larger aircraft or the airport relocated so that a resort and shopping center could be developed to attract more visitors to the district. The consensus of those appearing before the Commission was that the airport runway should be lengthened to provide better service to the community and the airport eventually relocated to another site. Following the meeting, the HAC decided to ask the Attorney General’s Office for an opinion on whether or not all or part of the $265,000 appropriated by Act 150, Session Laws of Hawaii 1957, for the relocation of Kona Airport could be used for an engineering study for selection of a new site. The Attorney General’s Office stated that the amount appropriated by this Act could be used for such purpose and the HAC decided to ask the Territorial Planning Office for a sum not to exceed $100,000 for the required engineering study. Lublin, McGaughn and Associates, architects and consulting engineers, undertook a study to select a new airport site in September 1958 and reported their findings and recommendations in December 1958. The report recommended that the airport not be relocated at this time, that the existing runway be extended 600 feet to the northwest (away from the town of Kailua-Kona), and the airport be relocated at such time in the future when demand for the land now occupied by the airport was so great that its value exceeded the cost of relocating the airport to the recommended site. The report and recommendations of the engineering firm which conducted this study were adopted by the HAC and transmitted to the 30th Legislature. Act 224, Session Laws of Hawaii 1959 appropriated $235,000 for the extension of the present runway. This appropriation, however, depended upon the availability of general obligation bond funds. Improvement of the airport was also subject to resolving the issues that led to an injunction against a similar project in 1954. The suit had to be removed before the HAC could formulate new plans for the airport. Act 224, SLH 1959, appropriated $235,000 for the Kona Airport Runway Extension. Act 23, SLH 1960, appropriated $50,000 for a study and recommendations regarding the relocation of Kona Airport, and $50,000 for expansion of the parking area and waiting room. Act 195, SLH 1965, appropriated $50,000 for construction improvements to the runway, terminal and other facilities. Act 38, SLH 1966, appropriated $100,000 for runway improvements. Alterations and additions to the Kona Airport passenger terminal building were completed in September 1966 at a cost of $17,313. Construction on a 600-foot extension to the existing runway began at Kona Airport in December 1966. The 3,800-foot runway was too short to allow F-27s or Convairs to operate fully-loaded and the extension was a stop-gap measure until the new airport at Keahole was operational. The additional 600 feet permitted larger passengers loads and would allow Aloha Airlines to operate the Viscounts for the first time in Kona. The extension would permit full passenger loads on turboprop planes serving the airport. Hawaiian Airlines’ DC-9-30 jets operated out of Kona, although not with full loads. On March 30, 1967, the Airports Division opened bids for a $170,000 project to expand the terminal and add new ticket counters for Hawaiian and Aloha airlines, and enlarge the baggage claim areas. The booths of the Hawaii Visitors Bureau and the Visitor Information Program were moved inside to allow for more loading space at the curb. A new air terminal across the field was expected to be completed in 1971. The Runway 11-29 extension from 3,800 feet to 4,400 feet was completed at a cost of $126,789. An Aloha Airlines Viscount became the first airliner to use the lengthened runway at Kona on May 7, 1967. It was the first time a four-engine passenger aircraft had landed at Kona. The Viscount replaced the F-27s that Aloha was using. Act 217, SLH 1967, appropriated $180,000 for expansion, improvements and alterations of the terminal building and parking lot. Act 40, SLH 1968, appropriated $200,000 for construction of additional improvements including additions to the aircraft parking ramp, apron, parking lot lighting and other improvements. Expansion of the terminal building, new baggage claim area, ticket counters and parking lot expansion was completed on October 25, 1968 at a cost of $144,652. The Visitor Information booth was relocated in 1968 as part of the terminal expansion program. On June 30, 1970 Kona Airport was closed and all operations were moved to the new Keahole Airport with operations beginning at the new airport on July 1, 1970. Governor’s Executive Orders No. 2874 dated October 11, 1977 cancelled EO No. 1684 as lands were no longer needed for Kona Airport. EO No. 2875 cancelled EO No. 1310 for the same reasons.